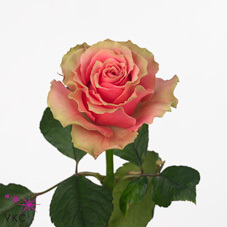 The Jolie Rose is a unique looking bi-colour brigh pink rose. Jolie Roses are small to medium headed, have a good petal count, strong stems, a good vase life and are fairly reliable to work with. Jolie Roses are wholesaled in wraps of 20 stems. Stem lengths range between 50 and 70cm tall depending on the grade chosen. If you are looking for a lovely bright bi-coloured pink rose, Jolie roses are always worth a try.